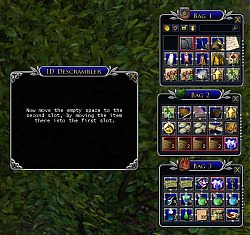 This plugin allows you to unscramble the slot IDs in your inventory bags. The slot IDs are scrambled each time you use the Sort button in your inventory bags, because of the odd way Turbine chose to implement the Sort feature. Normally the slot IDs don't matter, but some plugins (e.g. 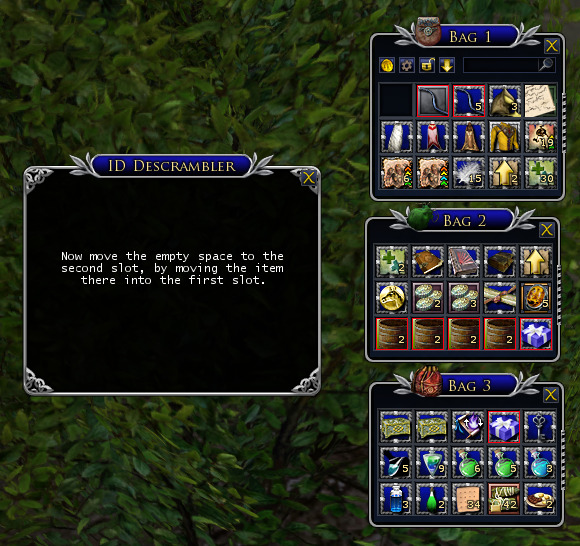 SequenceBars) that want to put stuff into specific bag locations have to rely on the slot ID numbers. It's easier to do this if the slot IDs are in order in your bags. The plugin uses a simple Wizard format that tells you what to do at each step of the process. It should not take more than a few minutes to complete. When the Plugin Manager opens, find Inventory Bag ID Descrambler in the list on the left side, then click "Load" to load the plugin. (3-Aug-2017) Version 1.3: Refined the instructions and reduced chat spam during descrambling. (19-Jun-2017) Version 1.2: Improved instructions and other minor tweaks. (19-May-2017) Version 1.1: Forgot to mention in the instructions that you need to make sure stackable items are stacked up into the minimum number of stacks. (19-May-2017) Version 1.0: Added Plugin Compendium support. (19-May-2017) Version 0.9: Initial release.